With all this Nor'Easter nonsense... definitely could use a Funko funkast hoodie right about now..
GeekyFinds wrote: With all this Nor'Easter nonsense... definitely could use a Funko funkast hoodie right about now..
That would be so awesome, I keep submitting to try and get the funkast shirt, it looks so awesome. A hoodie would be icing on the cake! At this rate maybe a parka! I would like an old-school letterman's sweater with a large Freddy Funko patch that I could put my buttons on. chincoteague1 wrote: I would like an old-school letterman's sweater with a large Freddy Funko patch that I could put my buttons on. i would definitely purchase hoodies and sweatshirts!! That would be genius. I have so many hoodies and sweatshirts, it's ridiculous. At least this would be something different and I love eclectic stuff. I could even probably get away at wearing this at work! I think today counts as day three of winter, so we could get a lot of use out of them. Yes, I would need one. I saw some pretty kool Funko sweaters at ECCC! I really need some to go back up on the shop. Yes need more hoodies like I said before!! Come on Funko south!!! Krazydave2000 wrote: Yes need more hoodies like I said before!! 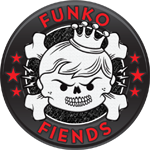 Come on Funko south!!! I would definitely want a simple sweater with a Funko/Freddy/Crown logo on it. I'd probably wear that everyday. The Funko sweaters look like they are good quality sweaters. I agree, a simple logo sweater would be best. The sweaters I've enjoyed the most have had stitched on patches with a simple logo. repair-manmanmanman wrote: I would definitely want a simple sweater with a Funko/Freddy/Crown logo on it. I'd probably wear that everyday. Me too and at Funko events. 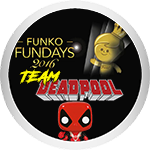 funko_nerds505 wrote: When can we get our hands on a Funko sweater? I'm really digging Sully's Funko FunKast sweater!!! I'd love a cute Funko crewneck sweater! Yeah I might just do this because I need a hoodie man!! funko_nerds505 wrote: They should totally make an ugly xmas sweater for the holidays. I’d love an ugly Christmas Freddy Funko sweater. scholora wrote: Would love some hoodies! Yeah! I can go for Funko hoodies also. Winter is coming. Hoodie or that sweet jacket they had at the HQ, looked real nice on Sully. Dean1217 wrote: I was saying this same thing around the holidays. I would have loved to see Funko Holiday sweaters. I would love Funko ugly Christmas sweaters!! !